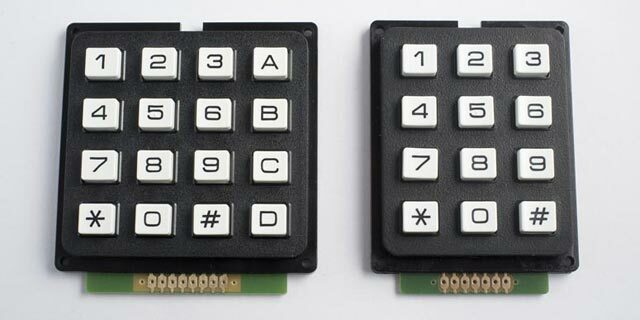 The keys on these keypads are arranged in a 3x4 or 4x4 matrix, and the usual way to interface to them takes seven or eight I/O pins, using multiplexing. 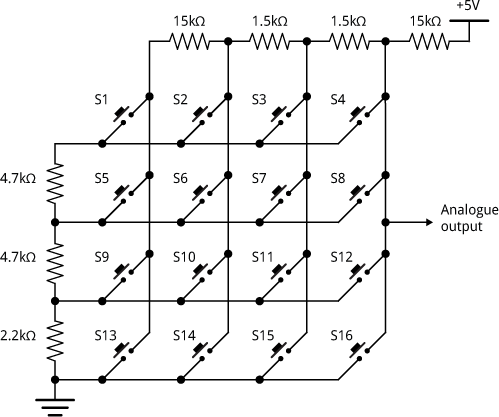 I was interested in whether it would be possible to interface a pushbutton matrix to a single analogue input, using a resistor ladder in a similar way to my earlier post Getting Extra Pins on ATtiny. The smallest gap between any pair of values is 28. The resistor ladder is connected to the analogue input A2 on an ATtiny85. 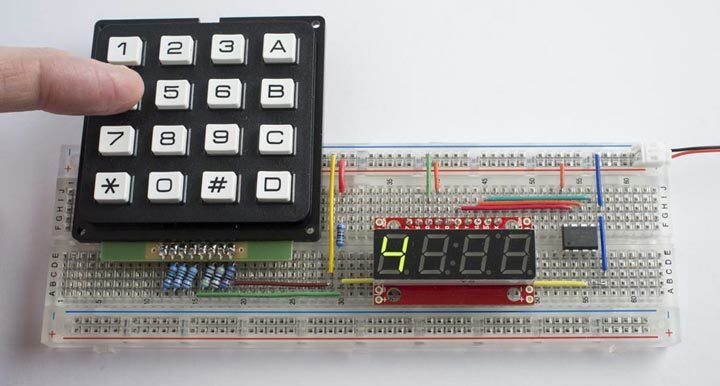 I'm using a serial seven-segment display  to display the key pressed; this is interfaced to three pins on the ATtiny85, using Jack Christensen's tinySPI interface . Here's the program. 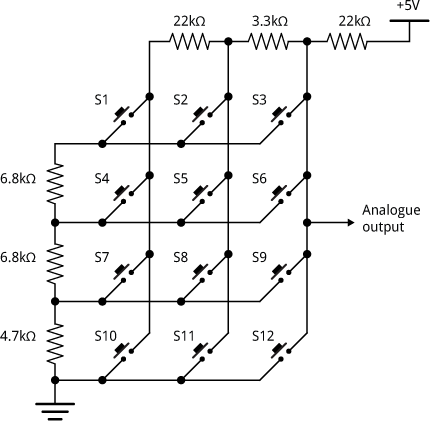 It uses two arrays; AnalogVals stores the analogue values given by each pin, in descending order, and Buttons stores the corresponding button for each voltage. The ReadButton() routine reads the analogue input, and then checks the value against each value in AnalogVals until it's larger; it then returns the corresponding button from Buttons. Note that I've changed '*' and '#' to 'E' and 'F' because the 7-segment display can't display those symbols. 23rd January 2016: I've now written up details of the program I used to calculate sets of resistor values: Calculating a resistor network.